As I hinted at in yesterday’s post on the Puhoi-Wellsford “holiday highway”, the most recent studies into the cost-effectiveness of this project are not the only ones ever undertaken. In fact, back in 2008, Transit New Zealand (as NZTA were then) undertook a strategic level study into the necessity of future upgrades to both this stretch of state highway one, and any upgrades that might be needed to state highway 16 in the future. 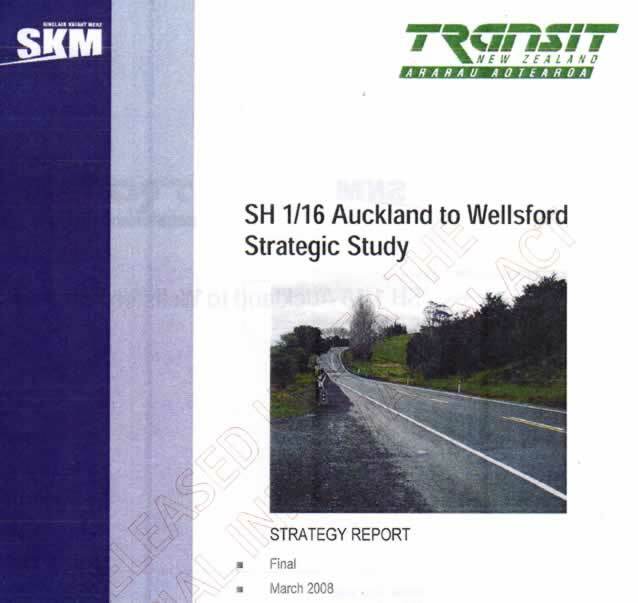 It was called the “SH1/16 Auckland to Wellsford Strategic Study”. The cover of this study is included below (the whole thing is 60-odd pages long and not really feasible for scanning and uploading as a whole unfortunately): It seems as though Transit NZ undertook the study because in 2008 they were getting close to finishing the Orewa-Puhoi motorway (which opened at the start of 2009) and all of a sudden went “hmmm…. people are going to start asking what next, we’d better look into this”. This 2008 study does quite a comprehensive analysis of the current situation along both SH1 and SH16, showing areas where there are current problems, what current traffic levels are, how they vary by day of the week (SH1 is highest on a Saturday morning and a Sunday evening, surprise surprise) and so forth. It also analyses the project population growth of this part of Rodney District, to come up with some pretty scary numbers, both for the expected population and especially for the “high” projected population: Now while I certainly understand that many of these population projections are well into the future, some are a little difficult to believe. Do we really expect the population of the Warkworth to Orewa area (which basically contains parts of Orewa and then everything north of it until Warkworth, and goes as far west as the railway line) to increase almost ten-fold over this time? Considering that the most recent in-depth research into Auckland’s future growth patterns suggests that an even more compact form of development would provide the best economic and environmental outcomes, I do wonder whether the population of the study area would ever reach the levels projected here. Creation of completely new alignment for main road north, roughly along current alignment of railway line. New alignment would become SH. Existing SH16 would become local road while existing SH1 would serve regional – rather than national – needs. Conversion of existing SH16 into main road north, and therefore would be significantly upgraded. Upgrade of both SH1 and SH16 to a similar standard, both serving national and regional functions. Given the magnitude of infrastructure within the SH1 corridor required to deliver the recommended strategy, it was recognised that implementations would need to be carried out in a number of stages due to financial constraints. It was also recognised that all of the simpler projects within this corridor have already been built and that any projects in the future are likely to be large scale, expensive projects in difficult terrain. The likely funding arrangements in th short to medium term for new infrastructure suggest that the largest practical size of an individual stage would be similar in scale to the current ALPURT B2 project, namely 5 to 8 kms in length. Past experience suggests that the timeframe for delivery of a project of this scale would be up to 10 years from inception to completion. 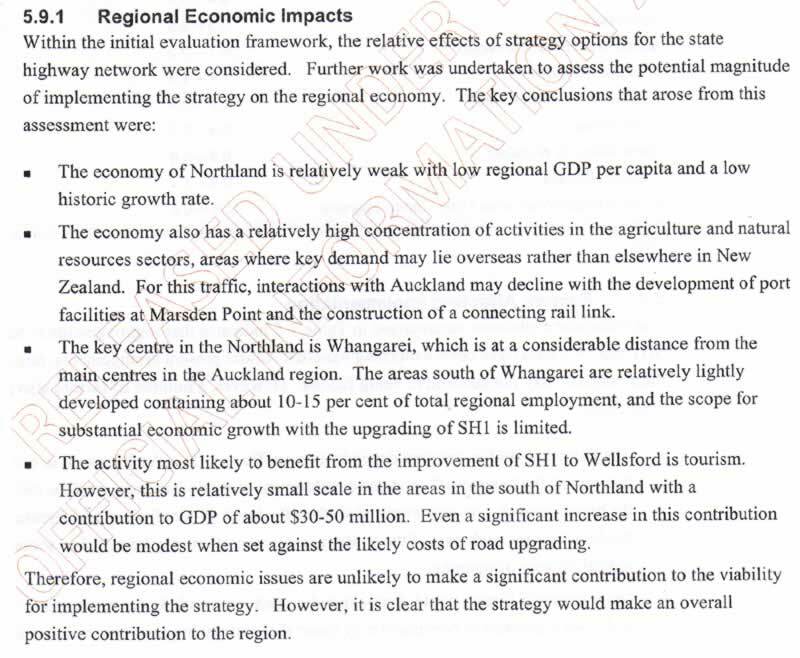 These considerations led to the view that for SH1 between Puhoi and Wellsford, at least six separate stages for implementing the strategy would be involved, with a time horizon out to at least 2051. Previous commitments to addressing safety concerns implied that first priority would be given to Schedewys Hill and Dome Valley improvements, otherwise the general priority would be a progression of works northwards from the end of ALPURT. Now the funding situation has changed a bit since 2008, with the May 2009 Government Policy Statement for transport funding pumping a huge amount of extra funds into large-scale state highway projects like this one (money that has generally come from reduced expenditure on local roads and public transport). But a number of other issues still stand – whether the project should be progressed in a number of stages so that the most important parts (such as safety upgrades) can be prioritised, whether it’s feasible to attempt to do the whole thing in 12 years when this study recommends completion of the next 40 years, and so forth. The issue of cost is a very interesting one actually, as the study breaks down the likely costs of the various parts of the project: Interestingly, some of the most critical upgrades – at least in terms of safety – aren’t hugely expensive, such as the Dome Valley improvements. 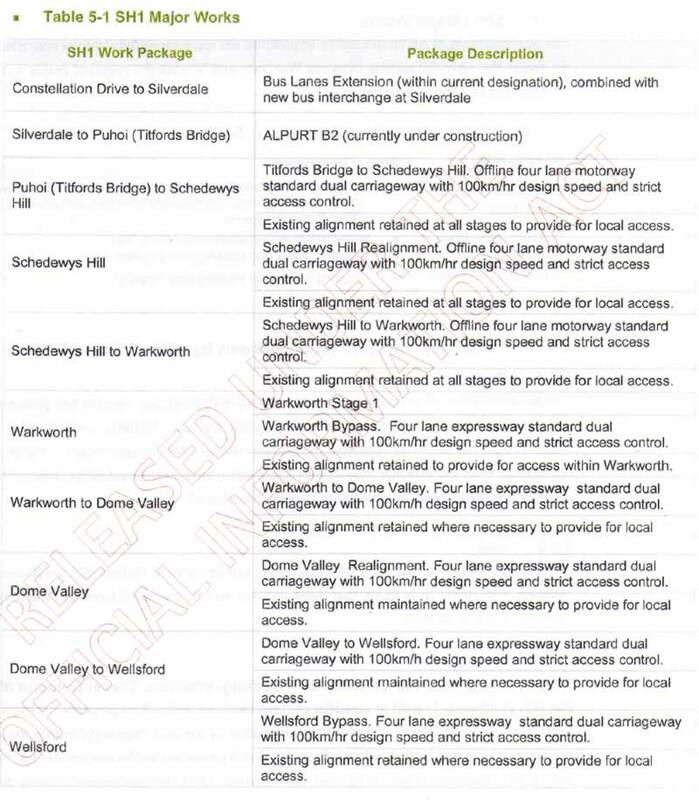 I am guessing that the cheaper price north of Warkworth reflects the study’s general assumption that the road north of Warkworth would only be built to expressway, rather than motorway, standard. Excluding the Constellation to Silverdale busway, the total cost (taking the upper band, which seems more realistic given that the estimates were made a number of years ago now) is around $1.3 billion – roughly similar to the $1.4-1.6 billion figures given for the current holiday highway proposal. Perhaps the most insightful part of the 2008 study though, is the economic evaluation of the various parts of the project, and the subsequent recommendations about when they should occur: I find it quite ironic that the project with the highest cost-benefit ratio is a public transport project. It is also ironic that while the remainder of the project advances, this busway project (which I don’t necessarily think is a public transport priority, but let’s set that aside for the moment) is the one that has dropped off the radar. Aside from the busway, it would appear as though a Warkworth bypass is the only other project that currently warrants construction. The Dome Valley and Schedewys Hill projects are major upgrades rather than simply focused on improving safety within (largely) the current road alignment, which I would imagine would have a far higher cost-benefit ratio. As for the much talked about “wider economic benefits” of the holiday highway, here’s what this 2008 study had to say: In short, the wider economic benefits were considered negligible. Overall, the project only appears necessary to implement in stages over the course of the next four decades, and even then only if what I think are hugely optimistic population growth rates are achieved. 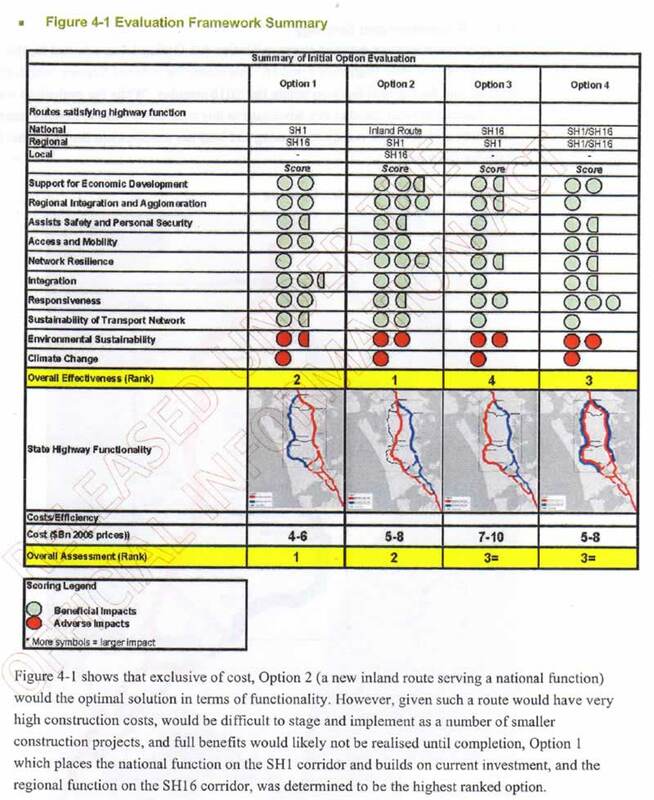 The upgrading of SH1 performs well against the criteria for strategic investment directions being developed by NZTA and against standard effectiveness criteria. With allowances for the potential wider economic benefits of the project, the BCR would be in excess of 1, but even if these are not included, the benefits of the project in terms of its strategic importance and its impact on economic development would have sufficient weight to offset the low BCR value. What changed in the intervening period I wonder, apart from the Minister of Transport of course. I thought an extension of the Northern Busway was something that NZTA were still pursuing? Or has that changed? Why do you persist on calling it the holiday highway?When I go up to auckland from whangarei it’s no holiday and its definitely no highway. RTC, it’s certainly not happening any time particularly soon from what I can see. UTC, the upgrade is called “the holiday highway”, not the existing highway. It’s called that because most of the problems are caused by people going on holiday. @Mathew – the government has already decided what they’re going to build and the BCR doesn’t seem to make any difference, if it comes out above 1 then they claim that that’s great, if not they still build it. It be fair, it’s Joyce’s Holiday Highway. He wants to get to Omaha in a hurry so this ‘road of national significance’ is all about him. That other people use it is helpful to the arguement that the road should be ‘upgraded’ to a four lane highway. A motorway from Puhoi to Warkworth cater for the large volume of traffic through this section. There is a high demand between Auckland and the areas east of Warkworth, such as Omaha and Matakana and to cater for this demand, a motorway provides a potential solution. They could have said Algies Bay, or Snells Beach, or Leigh or whatever…. funny that they chose Omaha.